It's no secret that I am a passionate advocate for using video in the classroom. 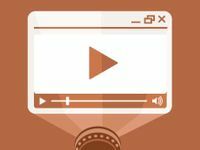 When used well, videos can help students make connections to people and ideas beyond their usual frame of reference. That's why I've been really excited to see a wave of new (and mostly free or low-cost!) tech tools recently that enable teachers to take favorite clips and make them more valuable for educational use. Whether you use videos to flip your classroom or you just appreciate the power of video to engage kids, maybe one of the tools in my playlist below will help you go deeper this school year. You may notice my playlist below looks a little different this time; I'm embedding using a great tool called Huzzaz, reviewed below. Watch the player below to see the whole playlist, or you can still view it on YouTube. Most educators know TED-Ed publishes amazing animations, but did you know their platform allows users to build lessons by adding questions and notes to any video on YouTube? The elegant interface allows your students to watch and then dig deeper into resources you've provided, via a unique URL that allows you to track their responses. See an example. If you'd like to have a discussion around a particular video, Vialogues is a useful way to allow threaded conversations on a clip. You can also add surveys and open-ended questions with this tool, which was developed by the EdLab at Columbia University Teachers College. See an example. Wanting to string a few videos together and add text and graphics overlays? Metta is the tool for you -- although it had one of the more confusing interfaces on the list. Still, it's unique from the others in that it's creating less of a wrapper than a whole new media experience, a mashup -- for some applications, this could be amazing. See an example. VideoNot.es is an app that allows you to take live time-coded notes on any video, and skip around by clicking on those notes -- and even better, it's integrated with Google Drive so saving and syncing your notes is simple. You have to install it to see this example. With teacher favorite Zaption no longer available, Playposit (formerly EduCanon) has emerged as a great to to allow you to supplement a chosen video with all manner of add-ons to make it more interactive, from "reflective pauses" to audio clips to multiple-choice questions. You can also track responses with this tool. Huzzaz is about discovery and curation of videos -- it's an easy way to collect, sort, and take notes on your playlists, from both YouTube and Vimeo. If you love gathering videos on themes, you'll find this tool very powerful. Or, have your students curate playlists on choice topics! See an example. I'd hazard a guess that the popularity of the flipped classroom idea is one of the drivers of this renaissance of tools to make videos more flexible and useful for teachers, but any teacher could find a way to use this kind of functionality to add value for learners. Below, I've listed some more detailed reviews of the tools above, as well as a few more resources for both finding and using great video in the classroom. I hope my enthusiasm has encouraged you to jump in and play with a few of these tools! And if you have other ways of supplementing or enhancing videos you use, I'd love to hear about those in the comments.